Every so often I like to splurge on my kitty; everybody does. How can you not? The thing is, how do you spoil and splurge on a cat’s food knowing that it is truly delicious, healthy, and safe. Well, recently I found Weruva. This pet food company calls themselves “super luxe”, and claims their pet foods exceed even human consumption standards. I have to tell you, with products like Marbella Paella, Polnyesian BBQ, Asian Fusion and Mideast Feast you’ve got to be tempted. I started with the Outback Grill. Now, I should have read the label better because I assumed “grill” meant meat. My kitty does perfer meat over fish. When I opened up the can it was all fish. Yes, all fish, chunks of fish, and even what looked like a little cartilage, all stuck together in a savory aspic. Me, the human was totally grossed out. The smell and site of the maritime carnage is not for the faint of heart. But….. I am not a cat. Let me tell you, my cat that turns his nose up at fish, gobbled the entire bowl in less than a minute. In fact, I’ve never seen him eat so fast. Afterwards, he purred, jumped around, slept in utter contentment. This cat food is super luxe. I’m happy my kitty is happy. I was happy that the product was 100% real fish, no fillers, and no grains. I can’t wait to try the other varieties we bought. Tonight will be the Polynesian BBQ. 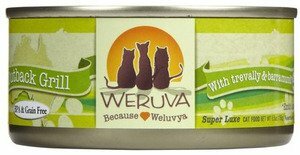 Now Weruva is not inexpensive, about $2 per can at a local pet store. For the best deal, go to an online retailer like Wag.com and buy a cast of 24 cans.